I previously wrote about leaving some perches in my pasture for bluebirds to hunt from. 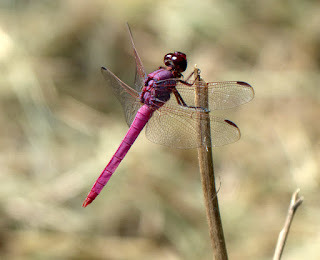 Today I learned that dragonflies also use perches, albeit shorter ones, to hunt from as well. This morning I was out doing some work in my pasture when I spied, what I affectionately call, a pink lemonade dragonfly far from a water source. It was perching on about a foot high piece of stubble left after we recently mowed the pasture. I watched the dragonfly for a bit and it looked like it was contentedly hanging out so I took off for the house to grab my camera. Happily it was still there when I got back. Occasionally it would fly off but returned fairly quickly to the same perch. One time when the dragonfly flew off, it was replaced immediately by a grasshopper like there was a game of king of the hill in progress. 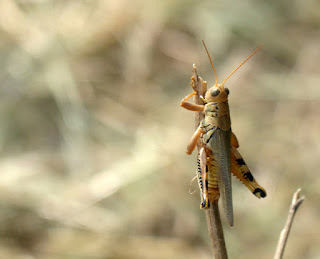 The grasshopper decided not to hang out so quickly though that I only got one shot of it. While I took my first series of images of the dragonfly, from essentially a rear, side view, I noticed it was chewing and grooming every now and then. I have observed the grooming behavior before but don't remember noticing chewing. After taking several images I went back to work. Once I finished what I was working on, I approached the perch from the other direction and decided to take more pictures from the side and a somewhat front view. I was surprised by what happened next. After one trip flying off the perch and landing again I was able to capture the dragonfly chowing down on a small flying insect. That explained the chewing motions I noticed previously. I got lucky enough to capture it eating a different small flying insect too. The second insect was a tad larger and I suspect a bit tougher as it took the dragonfly longer to finish its second catch. I take a lot of pictures of dragonflies and sometimes I wonder if I really need any more dragonfly images. However I really enjoy the challenge of trying to capture a great image and today I was reminded that you never know what surprises you will see when observing nature, so dragonflies are still on my list of subjects to be photographed. New Visitor - Can You ID This Frog? A couple of times this year I have scared up a frog that I did not recognize while mowing. It always disappeared too quickly for me to get a good look and be able to tell for sure. Finally about a week ago I got lucky and one stopped in an open area when I paused the riding mower to try to get a good look at it. It was quit a bit bigger than the cricket frogs and definitely a frog and not one of the Gulf Coast toads that hang around. 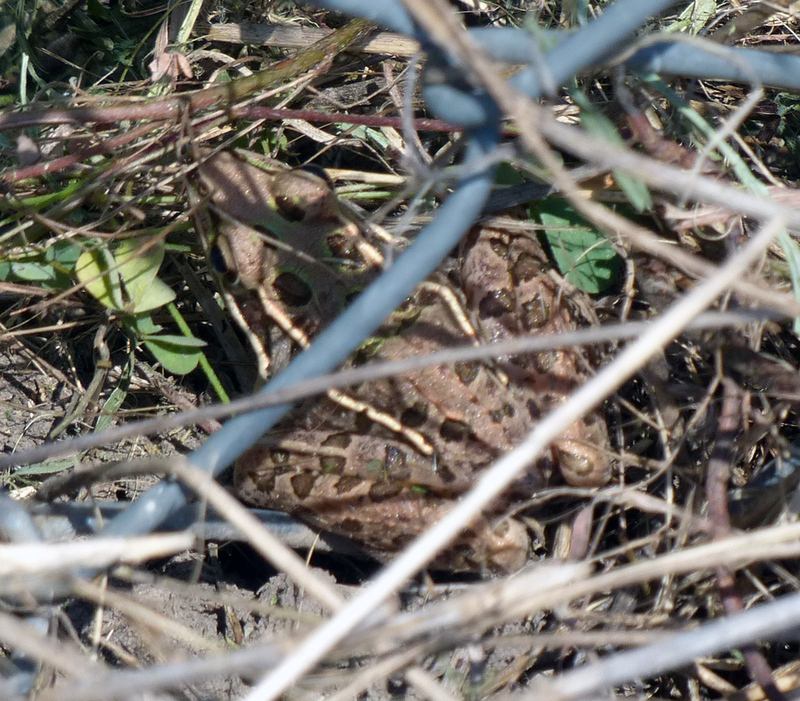 I have never seen a bullfrog with stripes down the sides so I ruled out it possibly being a very small bullfrog. Luckily my other half was home and I was able to phone inside and ask him to bring out my camera. I got lucky and the frog hung around during this process. It got skittish when my camera was handed to me, but I did manage to get one shot of it after it hopped through the chainlink fence. This brings me to another curious thing about this new visitor. 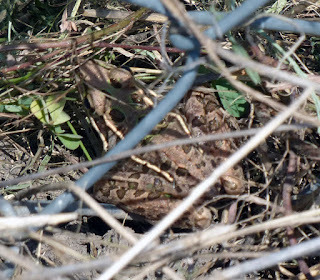 I had only seen this frog while mowing various areas of my property but never very close to water. I don't know if I have seen one well travelled frog or if I have several of them hanging around. A couple of days ago I finally spotted one in my pond. I would love to know what species this frog is. I've not had a chance to look it up since I got pictures. Please leave a comment if you think you know who my new visitor is. Edited 7/30/17: Thanks to those of you who contacted me off blog and let me know you thought this was a leopard frog. I looked it up and agree that it looks like the Southern leopard frog or possibly the Plains leopard frog. 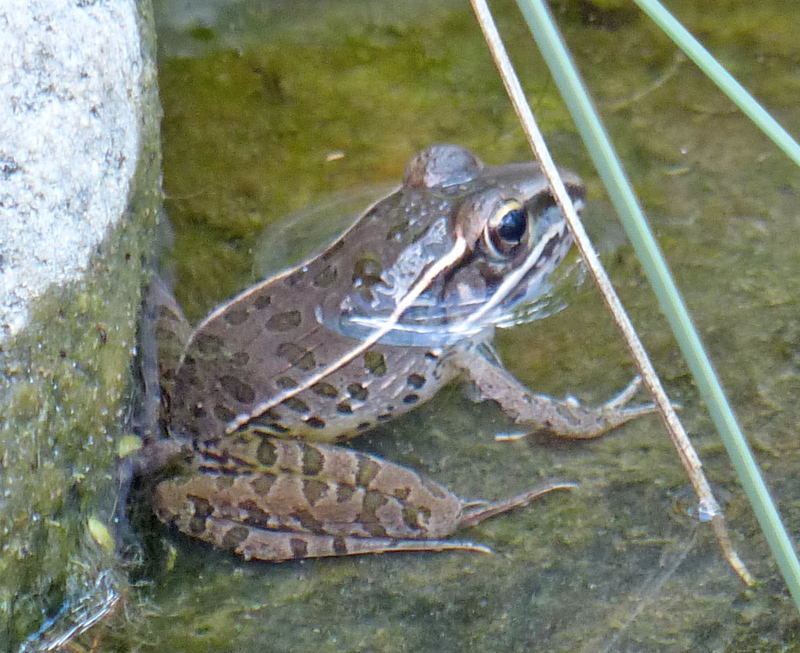 Mystery pretty much solved but if you have a thought as to which type of leopard frog it is, please let me know. 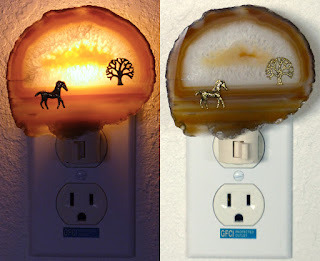 While I have talked about my agate slice and nature charm night lights online in other places, I was surprised to see I have never devoted a blog post to them. They have been seen on my blog but only as part of my retired "Thanks for the Treasuries" feature, when they were included in an Etsy treasury. I first tested this product by providing nature charm night lights wholesale to the Arlington Museum of Art's gift shop in the summer of 2014 when they featured an Ansel Adams photography exhibit. The agate night lights were well received and because they sold well, I decided to add some to my EDCCollective Etsy shop after the Ansel Adams exhibit closed. It is fun to pick an agate slice and figure out what type of scene can be created on it with the various nature charms I have acquired. Some slices have what looks like a horizon line and are fun to add trees and shrubs or critters running across the landscape. Others are less specific and work well with a variety of critters flying across their face. Once I've made the charms suitable for mounting, I fix them on their slice. 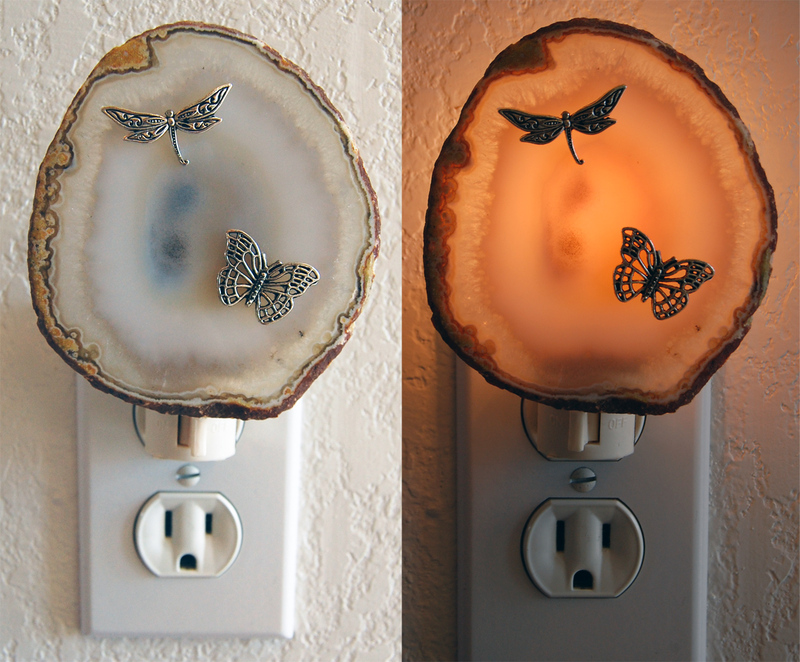 The agate is then attached to a bracket that then is fixed to a switchable night light base. These night lights add a decorative touch to any room by day and a welcome low light to navigate by at night when switched on. Keep one in a guest bath or bedroom to make it easy for guests to navigate when they come to visit. I use one in my house whose light can be seen from my front door so that I can leave a small, low energy using light on when I know I will be home after dark. It is nice to have that bit of light to welcome me home without making the electric meter spin as much as a larger light left on would. Since I started making my nature charm night lights, I have found some more wonderful silhouettes to attach and have added these to both of my Etsy shops. If you subscribe to my newsletter, you have already seen them. 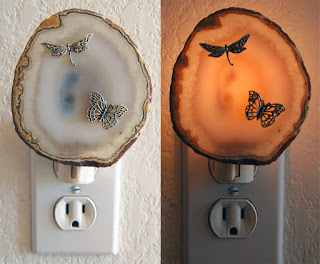 If not, you can check out my night light listings at EDCCollective and EclecticSkeptic. I will tell their stories in a later blog post. Being a science geek myself, I am always on the lookout for ideas or supplies to inspire new goodies for my science geekery section of my EclecticSkeptic Etsy shop. I was excited to receive a new shipment last week that included items I could use to create math, mythology and science themed items for EclecticSkeptic. The science themed items will thrill dinosaur buffs. I have already added two new listings. The first item I made and listed was a pair of gold plated ceratopsian dinosaur post earrings with a lapis lazuli dangle. I also have silver plated available and lots of different gemstones that I can make dangles with. Contact me if you have a specific gemstone or pearl request. The second item I listed was a sauropod necklace. I love the colorful dino teardrop pendants. The teardrop bezels are antiqued brass plated and I thought a thin, black satin cord necklace finished off with the same color findings would be a perfect pairing. 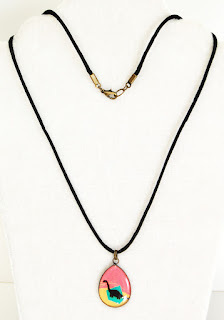 If you prefer a different length necklace, contact me to create a custom length piece for you. 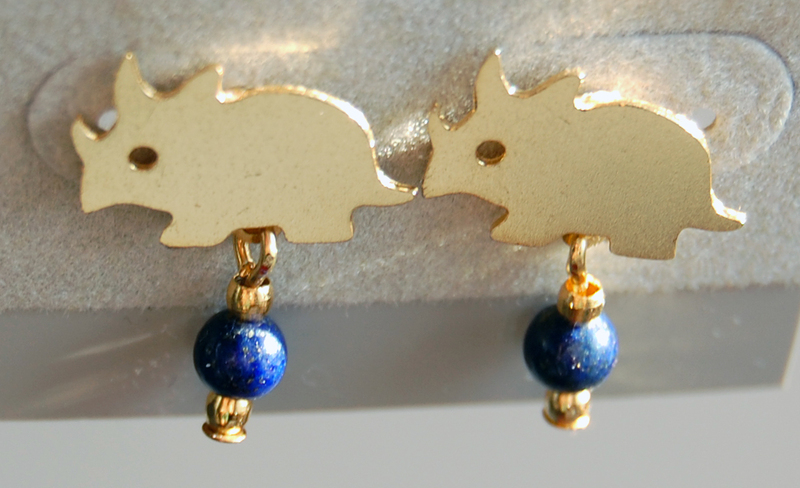 Stay tuned for T. rex earrings or contact me about them.